I had scheduled caesarean section 6 days ago at 39 weeks gestation. My baby came out with a big bump on his head (hematoma)! My gynaecologist said he used vacuum suction for few seconds, because the width of my baby's head was grearer than the length of his incision. I'm so worried. Can this hematoma cause any further brain development problem or any tardiness on my baby? I appreciate any useful comments! It is a common practice to use mild suction pressure to help deliver baby’s head during caesarean section. Forcing foetal head through the small cut on uterus can cause abrupt compression of baby’s head, especially if the baby is big and the caesarean section is preplanned. Vacuum extraction assisted caesarean section offers a safe alternative in such situation. As compared to prolonged fundal compression used for the purpose, it is a nontraumatic and rapid method for delivering the fetus, who is yet floating high. It minimizes the risks, both for the baby and the mother. Moreover, a large cut on uterus is avoided to preserve the function of the uterus and to reduce the chances of complications such as rupture uterus in following pregnancy and childbirth. 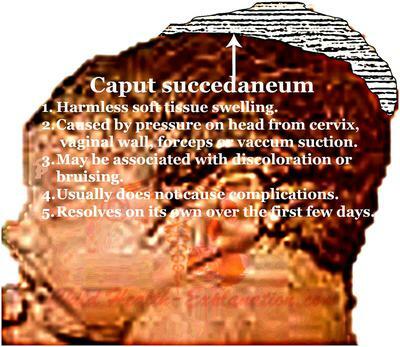 The most common cause of a bump on the head of a newborn is “caput succedaneum”, which is not a hematoma, and does not usually cause any complications. 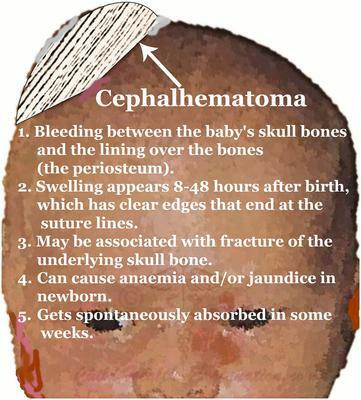 Cephalhematoma on the other hand is bleeding from small blood vessels crossing the membranous covering of the bone. Sometimes fracture of the associated bone also occurs. Both hematoma and fracture usually do not need any treatment. They resolve on their own over a few weeks. However, the two common causes of concern are anaemia due to blood loss, and exaggerated neonatal jaundice due to reabsorption of the collected blood. As for child’s future brain growth and development, it is difficult to opine on at this stage, and definitely not with the information provided. It would depend on several other factors associated with child birth, prenatal history, and child’s future physical and emotional health.